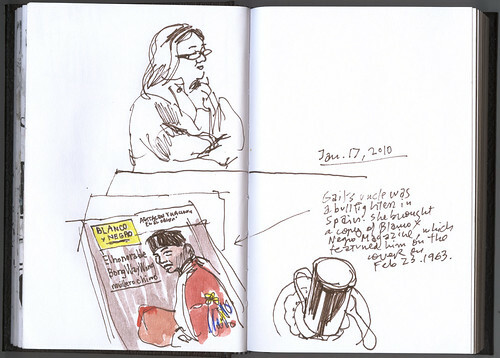 It's also taken me a while to post my drawings from January's crawl. Here they are! A view of Wallingford Center from across the street. 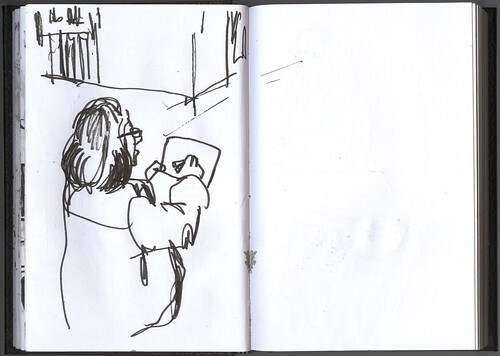 On the far left side of the page you should be able to see a tiny silhouette of Gail sketching. I point to it with an arrow. Gail at work on this awesome sketch. Over lunch, I browsed through an old issue of a Spanish magazine featuring Gail's uncle, who was a bullfighter in Spain back in the 60s. She brought it so I could see it. What an amazing story! 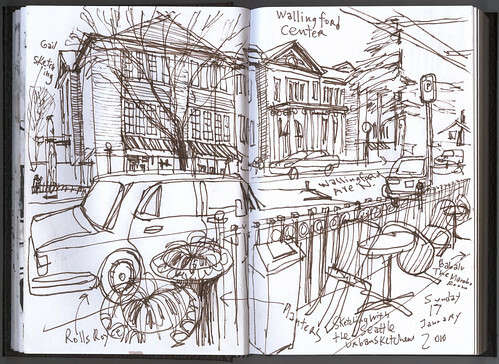 And last, in case you didn't see it on Facebook or the other blogs where I post, here's a video of me sketching on Capitol Hill. The neighborhood blog contacted me interested in shooting the video while I sketched. Great Video! and Thanks for the sketch of me and my uncle on the Magazine cover. I just sent it to my family. They will get a kick out of it. full of life as always! wonderful to see!